Ah, life-giving water! Nectar of the gods. Plaything of gamers. You've gotta check out the demonstration of this new liquid-rendering technology from PhysX, which has me really, really excited for the future of aquarium-punching sims. Now isn't it sweet to see a variety of animal-shaped statues pelted with water? All those cool little splashes echo my soaring sense of wonder; the realistic sea foam bubbles and froths like my slackened jaw. It's the ruthless breaking of that (thankfully fish-free) aquarium that really takes the cake for me - just think of all the city-flooding possibilities we could achieve with such a technology. Guys, I think I figured out how to fix SimCity! Introduced this week in the PhysX blog , the technology's referred to as "Position Based Fluids" and it'll be shipping in future versions of the PhysX software development kit. That means it's likely to be awhile till we see this stuff in our video games, but I'm excited already, and especially keen to see it used as more than just a prettifying tool. 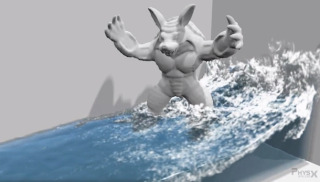 Think of the way Little Inferno played with fire - how awesome would it be if an entire game was based around the artful, considered sloshing around of hyper-realistic water?